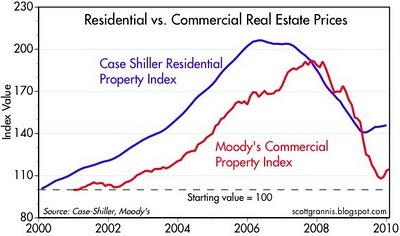 Commercial Real Estate Market: Better or Worse? Opinions on the real estate recovery seem to change with the news cycle. Just a couple of weeks ago, an article from USA Today titled “Commercial Real Estate’s Improving Health Exceeds Forecasts” indicated that we’ve taken a step forward in the commercial real estate market. The report noted that lenders’ distressed commercial real estate loans decreased by $7 billion from last September to February, and mortgage defaults for office, retail and industrial building loans fell for the first time since 2005 in the fourth quarter of 2010. In the last few days, news from Reuters that delinquencies in the CMBS market have reached record highs may indicate a step back, though values provide hope that this reverse may be just half a step back. The real estate attorneys in Miami-Dade, Broward and Palm Beach counties at our firm understand that part of the reason for confidence in the commercial real estate sector is that lenders have become more adept and astute in their management of distressed commercial loans. During the downturn, we worked with many of our clients to help them to restructure their loans on major commercial properties with their current lenders, enabling both parties to avoid the negative implications of a default. We assisted other developers who elected to surrender their properties via deeds in lieu of foreclosure, simultaneously securing releases of their personal guaranties. Once released, many of these developers have been able to pursue new projects that are better suited to the ever-changing financial climate. With the volume of commercial loans which are underperforming, lenders have been forced to adapt and become more willing to look at creative ways to keep properties afloat, especially now that the commercial real estate market is beginning to rebound. Developers need to keep in mind that no reasonable deal is off the table when they are negotiating with their lenders. We will continue to monitor and write about important matters for the real estate industry in Florida, and we encourage industry followers to submit their e-mail address in the box on the right in order to automatically receive all of our future blog posts.